The text of the messages published in the newspaper "Komsomolskaya pravda", 6 October 1989, was reduced and changed by editors. Names of the participants, title of the presentation and some important, on my view, details were distorted. Below is the original description of the incident translated in English by author. At summer 1989 a group of guards from Kharkov city watched over a fruit garden which was as large as a wood - about 700 hectares in southern part of Saratov region. September 21 they will remember for ever. This very day they have caught alive "yeti". This day started usually. In midday the guys had taken hold two prowlers trying to steal apples in the garden and conveyed them to police. Closer to evening the group continued to guard the garden on a small auto Zhiguli. They noticed from a road that one more human figure had glimmered between trunks of apple-trees.. The guys had to move resolutely. If the apple thief has time to run out the garden, he is left unpunished. Therefore, first of all it was necessary to cut off ways to escape for him. The group moved accordingly. Sergey Pirozhenko, possibly the strongest of them and former amateur boxer, had directed straight to him. Anatoly Yashenko and Sasha Zhemchuzhnikov had rushed from the rear. The stranger was seen poorly. This part of the garden was not processed for some time and was covered by high grass. This was a hindrance for Sergey to run, once he even had lost equilibrium and hardly kept himself on the legs. And almost had fallen... to clasp of the thief. The creature put its hands on Sergey's shoulders. Sergey had tried to released himself from these “embraces” by hard stroke in the torso, but in vain. He physically felt might of the stranger. So they stood some seconds. The creature did not bite, nor it did any hostile actions. Now the other came to help Sergey. One had picked up a wooden stick and pressed it over the creature head from behind. Other pulled its hands back. The third rushed in its legs, trying to tumble down the stranger. Soon they succeeded. Sasha found the piece of a cord to wrap the hands of the hairy guest. The legs remained free as they have no more rope. Four altogether guards had carried the creature to the auto. It resisted easily, occasionally moved its legs, and made strange sounds. The guys had opened luggage back in Zhiguli and jostled the trophy there. Having slammed the door they got time to recover. What to do next?! After they restored to a normal state the guards went to the nearest settlement to inform the police about the situation. It was necessary also to find a place for the creature captured. Some curious people approached the auto to look cautiously at an unusual being. The rumor quickly had flown the district. The guards did not find a suitable place and returned to the camp. The captive was restless. The auto strongly shook from its movements. The owner of the auto was afraid that it could be damaged. After short arguing, the guys decided that it is possible to keep it till morning. Anatoly for safety had intended to close luggage door by a key. Coming to the auto, he pressed the button. At once the hominoid with force had flung the door open and jumped out on the ground. It managed to free its hands. Then it rose to full high and looked around. It quickly directed to the garden and stood for a while under trees. When the guards tried to point the auto lights at him, he had disappeared among apple-trees. It became quickly known in Saratov city about the incident. There was already a group of active hominoid researchers. It was not the first encountering of such creatures in the area. That very summer a meetings already were near Kirov collective farm and village Voskresenka. The researchers quickly got to the place. They made a video and audio records of narration from all participants of event. The videofilm was made also. The guards yet not recovered. They again and again discussed the event and complained about mistakes. All of them understood — such can happen only once. Unfortunately, being in such condition they did not think that it was necessary to collect everything, that might be useful for research of the creatures. The luggage place in the vehicle had strong disgusting smell, the surface of it inside was covered with damp hair. The guards carefully washed and wiped all. And then they poured by petrol and burnt the smelling rags with hair. No photo of the creature was made also - neither the guards, nor anybody else who came to look at it had camera. I arrived to the camp from Moscow in one week after the event and was convinced that this improbable incident had really taken place. But as the creature escaped and relevant materials were destroyed, we might regret only for the missed opportunity to make a decisive step in solving the riddle of “living missing link”. And to hope for better luck in the future. 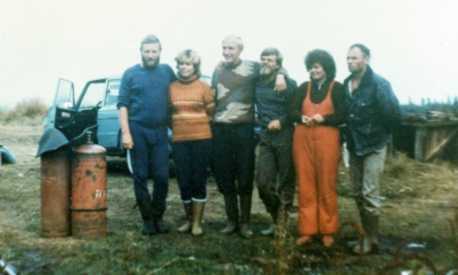 On the photo we see the participants of the event with their wives near the camp and garden. On the right is the chief of the group Anatoly Yashenko and his wife Valentine. At the left end is former boxer Sergey Pirozhenko who first seized the hominoid. At background we see the auto where hominoid was contained.